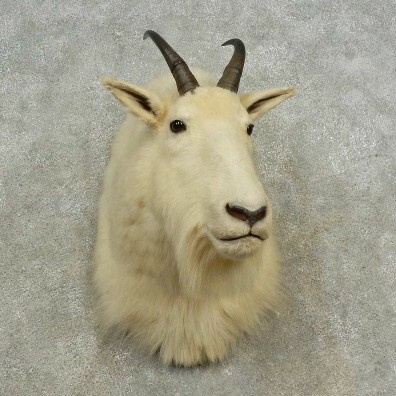 This is a phenomenal Mountain Goat taxidermy shoulder mount, posed looking slightly to it's right side out into the room. The hair and taxidermy quality are outstanding, and the horns achieve an SCI Bronze Medal Score of 26 6/8", earning this item our Premier Plus™ overall quality rating. All applicable dimensions are included to help ensure this item will fit within your intended display space. - It will hang on a single properly anchored heavy bolt or screw. The mountain goat is a beautiful, albiet peculiar species, as they are not technically true goats, but more properly known as goat-antelopes. The mountain goat is typically found along the western coast of Canada, and the northwestern-most parts of the US, in highly elevated mountain habitats. The mountain goat wears a thick white coat which acts as camoflage in the snowy mountaintops, as well as great insulation against the frigid wind. The mountain goat is outfitted with small horns which grow up and outward, as well as thick, soft hooves which help it navigate the dangerous mountain slopes. Bronze - 26" Gold - 28 1/8"
Bronze - 23" Awards - 47"
All-Time - 50" Minimum - 40"